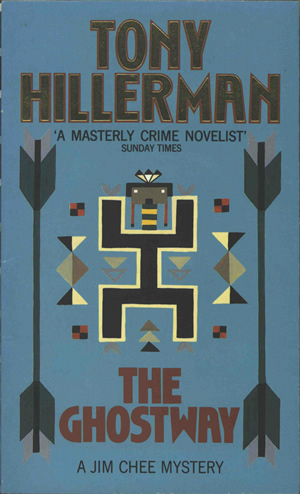 This is the Sphere Books Ltd. 1991 paperback edition of Tony Hillerman's The Ghostway, the sixth novel in the Navajo Mystery Series and third novel featuring Sergeant Jim Chee of the Navajo Tribal Police. Sphere books Ltd is a continuation of the Gollancz Ltd publishing house located in London, England, who first published a UK edition of The Ghostway in 1985. The front cover of this edition features a black stylized Yei figure outlined in white, surrounded by geometric shapes and flanked by what appear to be the fletched ends of arrows. The background is turquoise, and the author's name is printed in metallic gold with red outline. On the back cover, the fletched arrow figures are repeated, flanking the synopsis and a list of other Sphere titles by Tony Hillerman. The bar code is at the bottom of the back cover. Binding: Full-color paper covers. The title and author's name are printed in white on the spine, over a background of multicolored triangles.